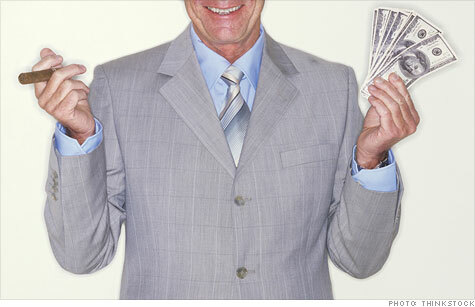 CEO pay jumped 36.5% - and the most lucrative sector was health care. NEW YORK (CNNMoney) -- Who says American salaries are stagnating. After two years of lower pay packages, chief executives at the nation's major companies enjoyed a 36.5% jump in pay last year, according to a leading survey of CEO compensation. The average pay hike is for the top executive at each of the Standard & Poor 500 companies, according to GMI, the research group formerly known as the Corporate Library. A broader survey of CEO pay at 3,000 companies posted an average 27% increase. Paul Hodgson, senior research associate at GMI, said the sharp rise in pay was out of line with the relatively modest improvement that companies typically achieved in profits or share price during 2010. $98 million for Joel Gemunder, who retired in July 2010 as CEO of Omnicare (OCR, Fortune 500), which provides drugs to nursing homes and other long-term care facilities. Both companies, in public filings, actually reported lower pay packages for the two executives. McKesson listed Hammergen's total compensation package as $46.1 million for the most recent fiscal year, while Omnicare listed Gemunder's pay package at $32.8 million. Neither company returned calls seeking comment. But GMI's analysis adds up total "realized pay" -- which includes not just salary, bonus and the estimated value of stock options granted, but also the value of profits from exercising those options and pension payments. Those items are not typically included in the reports companies file with the Securities and Exchange Commission. GMI also said Hammergen exercised more than 3.3 million stock options during the year, netting him $112 million. His retirement benefits also grew in value by $13.5 million. And, GMI added, his severance package would be worth $469 million if he were fired. Gemunder also benefited from a large exit package that wasn't included in the company's listing, as did two of the other executives who made GMI's top 10 list.